Aga Tours has 0 votes. Click here to see the results. Don't leave the fascinating city of Wroclaw every bit as ignorant as when you arrived! Especially not when the friendly staff at Aga Tours are on hand to help you! Up to five passengers can fit in their funky Melex carts and, for just 100 PLN between you, you can be chauffeured around the city whilst an audio guide keeps you informed on all the most interesting features of Wroclaw. These nifty chariots are fun, environmentally-friendly and weatherproof ensuring a comfortable trip for all. If you're busy during the daytime why not take their 'Wroclaw by Night' tour? Languages available are Polish, English, German, Italian and French. Great tour, we saw lot's of places. Enjoyable time! Thanks guys for such a lovely trip! Wroclaw is really beautiful with all this places that you show! Great tour - we saw so many lovely places with the interesting explanation! We could also stop to do some pictures on the way. Definitely worth your penny! Totally agree! Fantastic idea, quiet, quick, comfortable. You can get with them to the most interesting places in Wroclaw. Recommend to everyone! A trip around the Old Town in a golf cart is a great idea as many of the roads are pedestrian only and regular cars won't be able to take you there. Especially good for the younger and older folks. 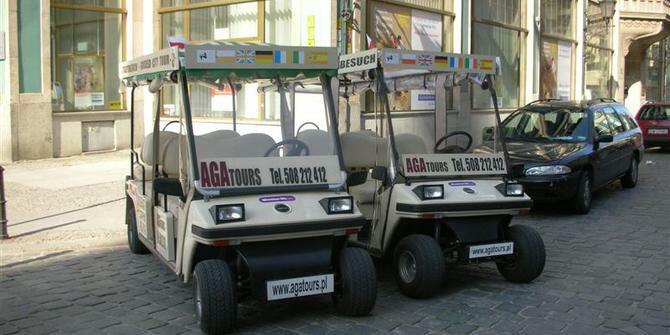 Add a widget for Aga Tours to your website and get more reviews!